If you’ve ever ventured into a coffee shop, you may have noticed that the days of ordering a black or white coffee have long gone. Take a glance at a menu, and you’ll come across all kinds of phrases, technical terms, and names. So what does all this coffee-related jargon mean? If you’re a coffee fan, or you’re looking to make sense of those chalkboards in trendy coffee shops or food labels at the supermarket, here’s a handy glossary of coffee terms to help you get by. Americano: a strong coffee made from espresso diluted with a splash or two of hot water. A popular choice for kickstarting the day. Cappuccino: one of the most popular orders, a cappuccino is made by combining a single or double shot of espresso with a substantial layer of frothy hot milk. It’s common to have your coffee adorned with chocolate sprinkles and even a stenciled pattern today. Crema: not a type of coffee in itself, crema is a word used to describe the distinctive fine layer of foam that appears on the top of espresso. This layer is said to be created by the carbon dioxide, which is present in the oils driven out of the coffee beans during the extraction process. The crema is the sweetest part of the drink, and it is instrumental to the enjoyment of any espresso. Purists will argue that without crema, you haven’t got an espresso at all. Cortado: a Spanish coffee, a cortado is very similar to a macchiato. The name comes from the theory that the milk cuts the espresso. This coffee is made by adding a spot of milk to espresso, but unlike the macchiato, foamed milk is not used. Espresso: espresso is rich, dark, strong coffee, which can be served alone or with milk to create different options, including a macchiato, cappuccino or latte. A traditional espresso is a single shot, which is served in a demitasse. This is a popular choice for the morning, as it provides a hit of caffeine. Espresso is made by combining finely ground coffee beans with hot water. Flat white: this is a foamy, milky creation, which is particularly popular in the USA. The flat white is similar to a cappuccino, but contains more milk. Frappe/frappuccino: made popular by high street coffee chains, this frozen drink is a hit in the summer when temperatures soar. Baristas make frappes using ice blended with coffee and milk. Latte: the indulgent latte is one of the most popular coffee bar orders. Made using hot milk and a shot of espresso, a latte is a creamy, decadent coffee, which is ideal for those looking for something sweeter than an espresso or a macchiato. A latte contains around ⅔ milk, and it is usually served in a tall glass. A barista may add chocolate powder for aesthetic impact. It’s very common nowadays to order flavored lattes. Popular options include caramel, coconut, vanilla, and hazelnut. Macchiato: a macchiato is a strong coffee, which is often considered the middle ground between a cappuccino and an espresso. Made by adding a dash of hot milk to a shot of espresso, the name is derived from the Italian word meaning spotted, marked or stained. You may also come across a macchiato listed as a caffe or espresso macchiato. Macchiato latte: a macchiato latte is a milky version of the traditional macchiato, which became popular in the USA. Rather than the milk marking the espresso, the espresso stains the milk in this case. Mocha: mocha is a sumptuous drink, which combines coffee with chocolate and hot milk. It is said to originate from the port of Mocha, where Portuguese traders came up with the novel idea of adding chocolate to their coffee. Barista: a barista is the person charged with making your coffee. Baristas often undertake training to enable them to craft perfect cups of coffee and ensure they understand everything there is to know about the processes involved and the different types of coffee on offer. Modern baristas also tend to be artistic, and they use patterns and their own creative flair to enhance the aesthetic appeal of the finished article. Chemex: this is the classic, egg-timer shaped glass vessel, which is used to filter and make coffee. The Chemex coffeemaker was invented in the 1940’s by Peter Schlumbohm. Cupping: cupping is a tasting method, which is employed by coffee professionals. The technique involves blending coarsely-ground coffee beans with water in small, shallow bowls. Tasters then use flat spoons to sip the coffee. Demitasse: a demitasse (meaning half cup in French) is a small cup that is often used to serve espresso. Drip coffee: drip coffee is made by exposing beans to hot water without excessive pressure. This can be done using a percolator, a filter, a press pot or a coffee maker. It is also possible to produce cold drip coffee by submerging ground beans in cold water for approximately 12 hours. This method can be used to create refreshing iced coffee drinks, which are an excellent alternative to classic choices during the hot summer months. Extraction: extraction is the process of taking flavor from ground coffee beans. It’s essential to get this just right, as under-extraction and over-extraction can affect the taste. Under-extracting tends to make coffee taste sour, while over-extracting creates a bitter flavor. The key lies in finding the right balance. Filter coffee: filter coffee is made using a paper, plastic or ceramic filter. This method of making coffee is often preferred by professionals and coffee purists, as it affords total control over the temperature of the water. Filters remove sediment, creating a smooth cup of coffee. French press: A French press is sometimes known as a press pot. 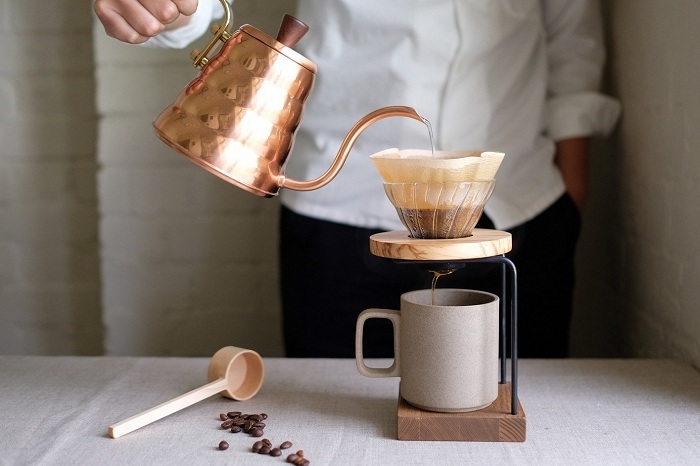 Frequently used to produce limited edition drinks in coffee bars, this method involves adding ground beans and hot water to a vessel that contains a plunger and a filter. The press pushes the ground coffee to the base. Green beans: also known as green coffee, green beans is a term used to describe unroasted beans. Latte art: a relatively new development, latte art is all about making the end product look as alluring and tempting as possible. To produce the best shapes and patterns, it’s crucial to get the density of the foamed milk just right. The name latte art can be slightly deceptive, as this is a skill that is not solely demonstrated by those serving lattes. 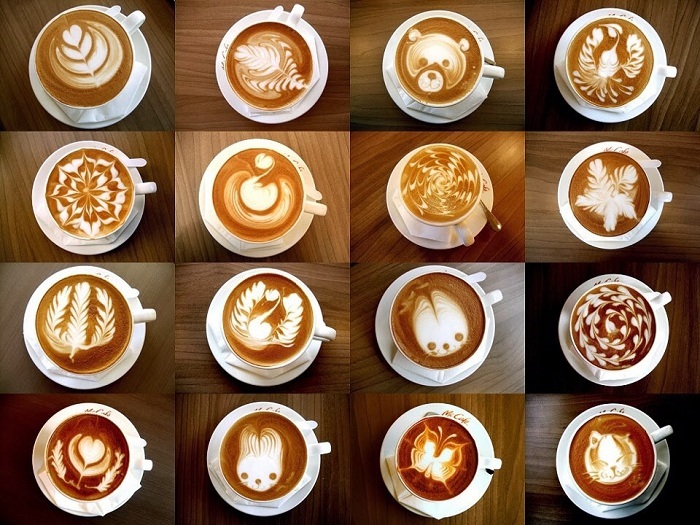 You can also find examples of art on cappuccinos and macchiatos. In order to produce high-quality coffee, green beans must go through a series of processes to make them palatable. It takes a lot of hard work and effort to turn beans into sumptuous cups of steaming, comforting dark nectar. Roasting: coffee roasting is the process of turning green beans into roasted coffee. The roasting process alters the chemical properties of the beans. Light roast: light roasting does not produce oils. It is designed to produce light, acidic flavors and the beans are usually a cinnamon-like color. Medium roast: this form of roasting produces a very small quantity of oil, and the beans are usually similar in color to milk chocolate. Medium roast beans have more body and power than light roast, but they are more delicate than dark roast. Dark roast: dark roasted beans produce a substantial amount of oil, creating bitter flavors with very little acidity. The beans are usually very dark in color. First crack: the first crack is a term used to describe the first stage of expansion when the coffee beans swell and make a sound similar to that of popcorn popping in the microwave. Second crack: this term relates to the second stage of expansion, when moisture is released, and the structure of the beans starts to alter. At this stage, much of the flavor is burned off. The noise is similar to that made when you pour milk over a bowl of popped rice cereal. Fair trade: when you’re browsing the coffee aisle in the supermarket or checking out a menu in a coffee bar, you may come across the words fair trade. Fair trade products are bought from farmers who are involved in cooperative schemes. The aim is to ensure that farmers receive a fair price for the products they sell. The fair trade movement was established to try and aid farmers and producers in the developing world to benefit from fairer trading conditions and better financial deals. If you’re conscious about supporting those who grow coffee beans, it’s always a good idea to look out for fair trade products. This is not a program that is restricted to coffee. You can buy all kinds of fair trade products, from chocolate and tea to cotton and sugar. Direct trade: direct trade is a term that relates to an agreement between a farmer or producer and a coffee roaster. This arrangement cuts out brokers. Those in favor of direct trade argue that it gives farmers more power and control at the same time as enhancing quality and making prices more competitive. Micro-lot: a micro-lot is a single farm, or a specific part of a farm or plantation that is famed for producing the best beans. It’s often useful to consider the analogy of an apple orchard when trying to explain what a micro-lot is. If you have an orchard, it may be famed for producing wonderful apples, but you might also find that there are areas of that orchard that offer up particularly sweet and juicy apples. The micro-lot, in this case, would be that area, and you would focus your attention on picking apples from the trees in that spot. 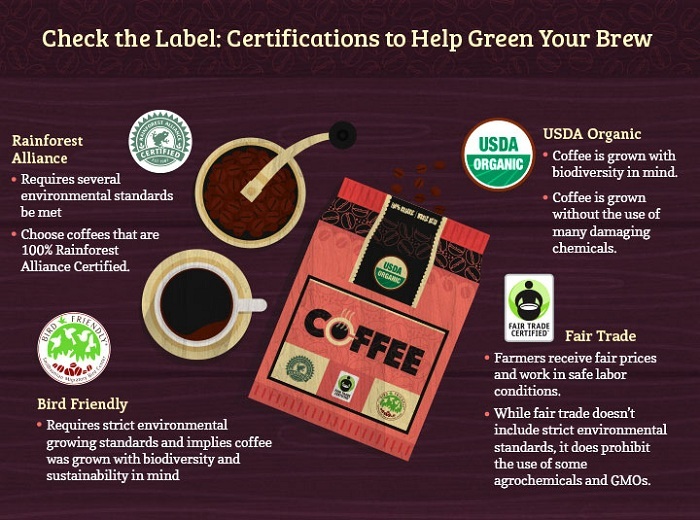 Organic: if you see a label that says ‘certified organic’, this means that the coffee has been produced using natural products and renewable, sustainable resources. With organic coffee, you can usually assume that at least 95% of the beans have been grown according to organic conditions. This means avoiding the use of synthetic chemicals and materials, including fertilizers and pesticides. Bird-friendly: bird-friendly coffee is sometimes called shade-grown coffee. It is popular in Brazil where there are often clashes between coffee plantation owners and those keen to preserve and protect the rainforests. 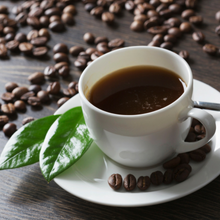 Bird-friendly coffee is grown amongst plants, trees, and animals that are native to the area. The initiative is designed to harmonize the relationship, and enable producers to continue growing coffee at the same time as conserving native species and preventing damage to forests. Even if you’re a self-confessed coffee aficionado, you may not have come across every term in this extensive coffee-themed glossary. If there were gaps in your knowledge, or you didn’t know much about coffee, and you wanted to learn more, hopefully, this guide to common coffee terms will come in handy. 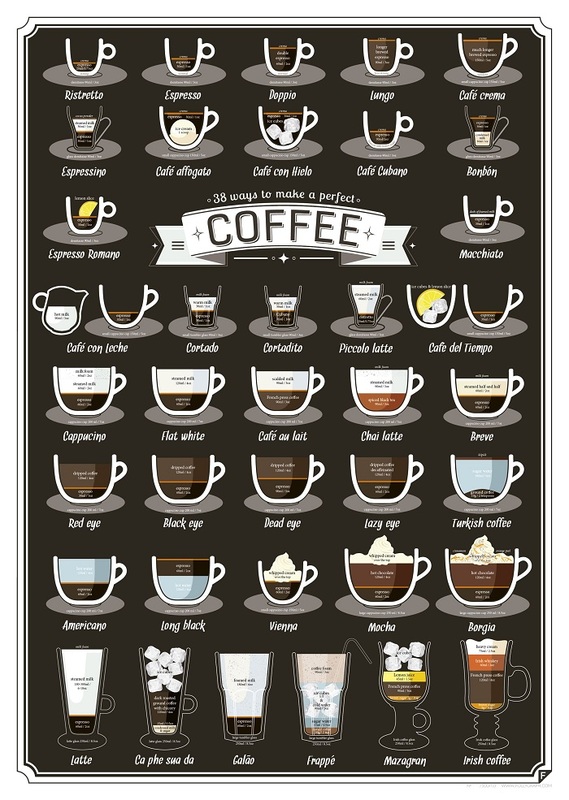 Whether you need to know the difference between a macchiato and a latte macchiato, you can’t remember the name of the cup you get your morning espresso in, or you’re interested in finding out more about labels you see on the bags of coffee you buy, this useful guide should provide you with a little extra insight. 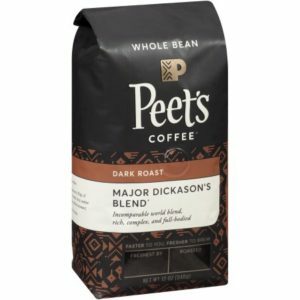 Major Dickason’s Blend, a blend of coffee from Peet’s Coffee, is a good option for many people looking for a rich, robust flavor. For those who simply love coffee – and like it the stronger the better – this is an excellent choice. It is a dark roast with a full body flavor. While it does a good job of working for the coffee experts out there, this blend is a good option for those who may not be a true coffee pro but who like a dark roast. It’s strong, which may not be appealing to some, but for those who want true pick me up power, Major Dickason’s Blend is a must experience choice. Peet’s Coffee calls Major Dickason’s Blend one of its most beloved products. It was first developed in 1969 and has stood the test of time through the generations of coffee drinkers because of its unique richness and overall strength. It was developed by Key Dickason, who was a retired U.S. Army Officer. It was further developed by the company’s team and, after sampling numerous combinations, they settled on this blend. Peet’s Coffee states this blend is it’s all-time best seller. There is no doubt this particular roast is intense and may not be the ideal type of first cup of coffee for the beginner. However, it is an incredible choice for those who want true coffee flavor rather than sugared-up and watered down products. The Major Dickason’s Blend sources its coffee beans from some of the most important areas to ensure quality. This creates a complex and rich blend of flavor. It is a deep flavor, no doubt, but it is not boring or standard by any means. What is there to love about Major Dickason’s Blend? It is a fabulous, rich taste. It is not your average cup of coffee. It makes an excellent espresso for those looking for a traditional roast. The flavor is complex, but it has a smooth taste to it. The smell is rich and strong – creating an intensity that fills the room. For the coffee lover who has tried numerous products previously, this blend is a must because of its satisfying flavors. However, there are a couple of drawbacks. Most importantly, it is essential to note it is a powerful cup of coffee and it may not be suitable to those looking for something mild and with less of a flavor profile. It also will not blend away with the addition of sugar and sweet ingredients. It is a coffee for the coffee lover. Peet’s Coffee recommends a French press for brewing Major Dickason’s Blend. However, it can work very well as an espresso as well. Don’t forget to read our guide on the perfect coffee to water ratio as well. It does not take much to create the perfect cup of coffee here, for a truly passionate coffee drinker. Peet’s Coffee Major Dickason’s Blend is made in the USA. Its beans come from Latin America and the Pacific areas. It creates a rich, complex flavor like no other. For those who are looking for a wonderful cup of coffee you can rely on for fantastic flavor and a bold taste every time, this is the blend to seek out. It may not be right for everyone, but for the coffee lover, it is a go-to solution every time.